If you are having a Halloween party, you will be wondering what direction to go in with decorations. Do you go full on scary? Or go stylish and modern? I have to say I am in between the two. I love the stylish wall decorations and balloons but I do love to have a few novelty items around my doors and garden. My first decorative item to show you is this beautiful balloon from Bubblegum Balloons. They sell a large range of unique and special balloons for all occasions. 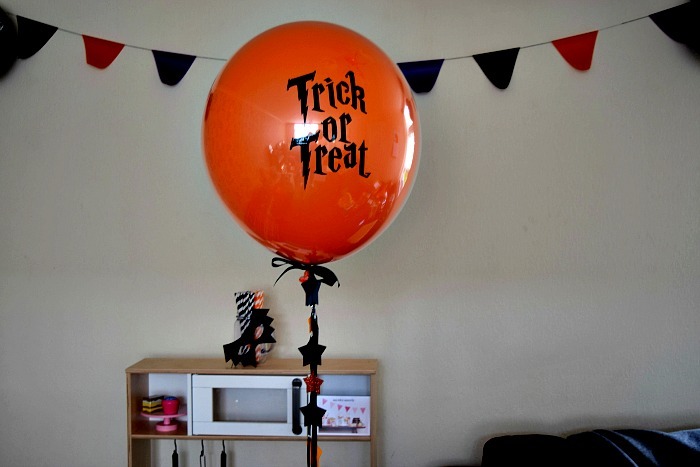 They have a complete collection of Halloween balloons available and you can see a fab photo of them here on Instagram. This balloon is huge and fantastic quality with amazing attention to detail with black and orange stars and fringing detail all hanging from a pretty ribbon on the underneath of the balloon. My Little Day have a huge range of beautiful minimalist decorations for any occasion and sent us a few items from their Halloween range to try out for ourselves. 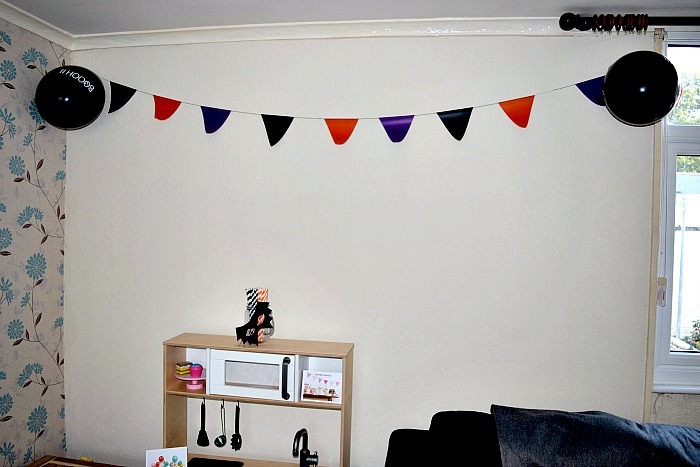 We received Halloween bunting, a pack of 5 'BoooH!' 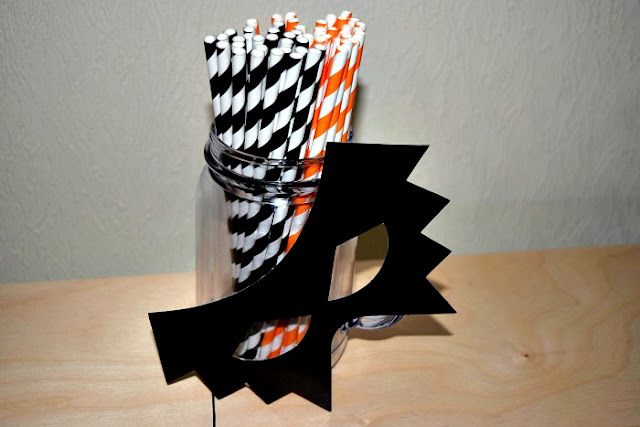 balloons, stripey straws in both orange and black and a pack of batman masks. The colours are so bold and really stand out, especially on a plain background. 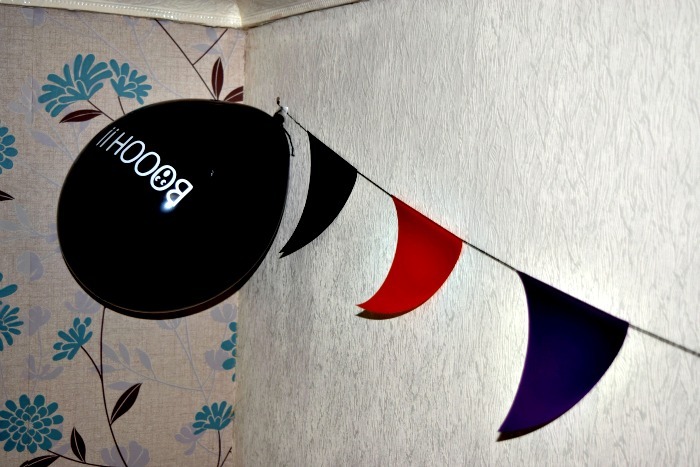 The bunting is very delicate, I worried I would ruin it putting it up but once pinned up it looks brilliant. The colours are the perfect Halloween colours and have really brightened up a dull end of my living room. It is also the area where the kids play and so will make the perfect backdrop for my Halloween party. The balloons are lovely and thick, they look and feel like they are great quality and are easily taped lightly to a wall or will easily withstand being kicked around by the children. The straws and masks are also great to have on show for guests to help themselves. I absolutely love paper straws. 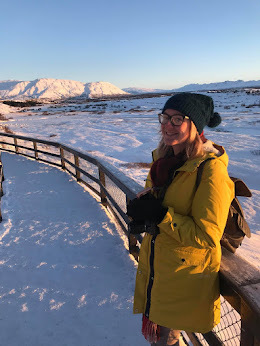 I think they are cute and quirky and they look great in photos! I much prefer to use them for parties than your average plastic straws that don't stand out. The masks are brilliant. My kids love masks anyway and are huge superhero fans. There is so much you can do with a mask whether you use it the normal way and wear it, or hand out to guests who haven't dressed up. You could use them for games, party bags, decorate them or use them as props. They can also be reused over and over. My Little Day has transformed a boring corner in to a cool minimalist Halloween themed haven. With just a few small items I now have a great start to my party decorations. I already have my eye on so many items in their Christmas and Super Heroine range. My Little Day is a Parisian brand but their items are available online or in a range of independent stores. You can find your local stockist here. The prices are so good that you just need to go and have a look at what they have! Now for my novelty items! I bloody love this Zombie gnome (pun intended) from Qwerkity who sell a range of great gifts for men. He is so cute and scary all at the same time and he will have pride of place in my garden this Halloween. I am half tempted to glue him down so no one can steal him though! He is currently in the sale for just £9.95 (Usual price is £14.99) which is a brilliant price. He is bigger than he looks in my picture. The plant pot he is stood in front of is quite a big one which houses our biggest strawberry plant. The best news about the Zombie gnome though is that I have a spare to give away to a lucky winner below so keep reading! Last but not least is lights! 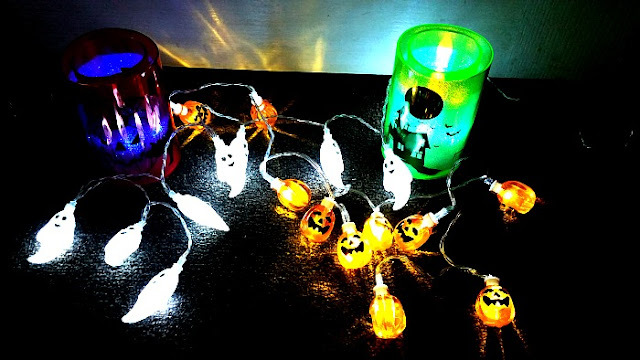 Every Halloween party needs lights. How else do trick or treater's know you are in and waiting for them! We bought these really cute tealight candles and Halloween string lights from the Aldi special buys event last week. Our local stores still have plenty left so might be worth popping to yours. The string lights are £3.99 per set and the tealight candles are £1.79? each and they all come ready to use with batteries included. Below we have an extra zombie gnome donated by Qwerkity to give away to one lucky reader. To enter simply fill in the Rafflecopter form below (Terms & Conditions can be found in the form). In the fridge, near the brains. This would be so fun for the garden. Halloween has always been a massive deal in my household. A couple of years ago I had a party and transformed one of my rooms into a "creepy carnival" theme.. made it look like the inside of a circus tent with red and white striped fabric and carnival music, and had "cockroach candy floss" "finger licking popcorn" (edible severed fingers!). I had a sort of demented hook a duck game, a scary hanging clown. The prizes for the hook a duck were teddies, but with missing limbs etc. I got an inflatable hammer from Poundland, and painted up old style freakshow signs. Outdid myself that year. LOL! Would be displayed as part of adult Halloween party in a hired hall. by the front door to scare everyone off. On the rockery in the front garden. In our back garden with our other garden figure, the Squirrel of Shame. My brother left him there to shame me into looking after our neglected garden! I'd keep it in the back garden, facing the neighbours I don't like! By the front door in October and then on patio by the gargoyle the rest of the year. My zombie gnome would go in the bathroom as a nice little treat for Halloween morning! on the mantelpiece ;) we are huge zombie fans. I'd move it around the house, into cupboards and dark corners, without anyone else knowing! Keep them on their toes! In the garden to scare next door neighbours children! 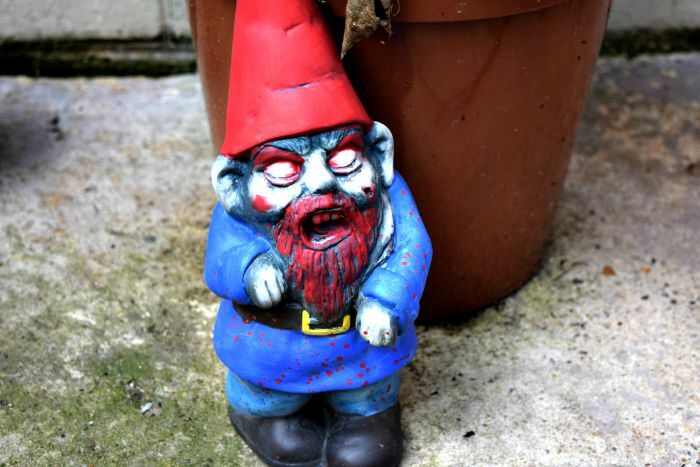 If we were lucky enough to win this fabulous Zombie Gnome, he would have pride of place in the rockery in our front garden! In my mums flower bed! It is hilarious love it!! My son will probably have this off me and keep it in his room with the rest of his zombie collection! I think our zombie mad friend would have to look after him for us.